During construction, the museum will remain open with many of the its most well-known artifacts kept on display. For more information on artifact locations, visit the museum’s website at airandspace.si.edu. The 1903 Wright Flyer, the aircraft used by Orville and Wilbur Wright to introduce powered, heavier-than-air flight to the world, will be on view in the east end of the museum until 2021, when it will be moved to a new exhibition on the Wright brothers opening the same year. The aircraft that was flown by Charles A. Lindbergh on his history-making, solo flight across the Atlantic in 1927 may change locations but will remain on view in the museum for the duration of the revitalization project. Columbia was the living quarters for the three-person crew during most of the first manned lunar landing mission in July 1969. 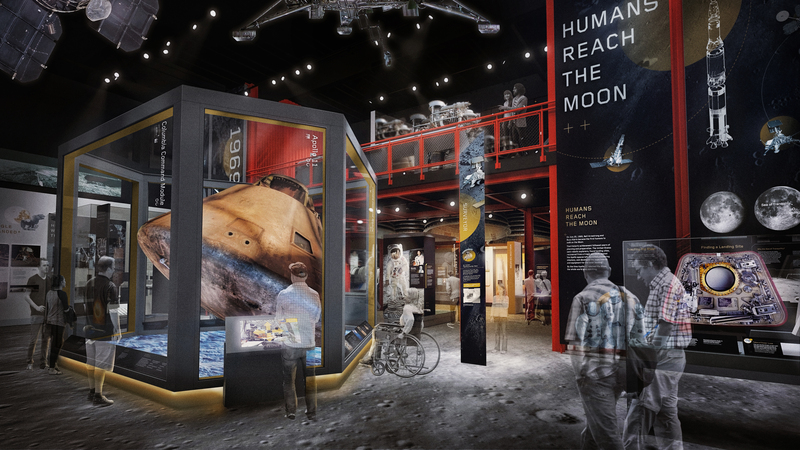 It is currently the key artifact in the traveling exhibition—“Destination Moon: The Apollo 11 Mission”—which opened at its first venue Oct. 14 in Houston. The artifact will be featured in a new exhibition on the Apollo era in the museum in Washington, D.C., opening in 2021. Bell X-1 Glamorous Glennis—The first airplane to fly faster than the speed of sound, piloted by USAF. Capt. Charles E. “Chuck” Yeager. Gemini IV—The capsule that carried astronauts James McDivitt and Edward White into orbit June 3, 1965. Apollo Lunar Module (LM 2)—A two-stage vehicle designed to ferry two astronauts from lunar orbit to the moon’s surface and back. The LM 2 was used for ground testing before the first successful moon-landing mission. Mercury Friendship 7—The historic capsule that enabled John H. Glenn Jr. to become the first American to orbit the Earth in 1962. SpaceShipOne—The first privately built and piloted vehicle to ascend just beyond the atmosphere, arch through space and glide safely back to Earth. Star Trek Starship Enterprise—The studio model used in the Star Trek television series that aired from September 1966 until June 1969. Telstar—A backup spacecraft to Telstar 1 and 2 (launched in 1962 and 1963, respectively). Telstar was the first “active” satellite (one that can receive a radio signal from a ground station and then immediately retransmit it to another) and the first technology of any kind that enabled transatlantic television transmissions.